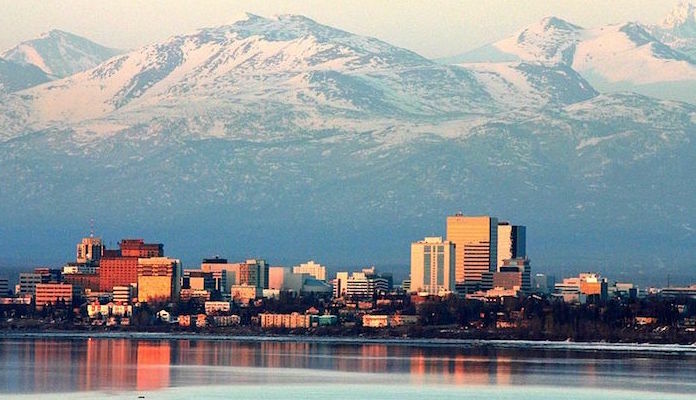 Anchorage is Alaska’s largest city, tucked into a peninsula of the Cook Inlet in the south central part of the state. Due to its centralized location between major world cities, the city of 300,000 is an important hub of transportation for military, shipping, and commercial airlines. 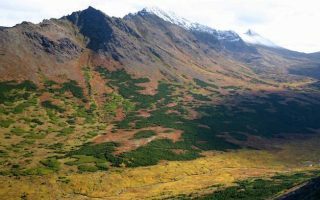 It’s also somewhat of a mecca for outdoors and wildlife enthusiasts who come to experience Alaska’s wild landscape, where the mudflats of the Cook Inlet, the Knik, and the Turnagain Arm rise up into thick coniferous forests and the mighty Chugach Mountains, just south of Denali. Running in Anchorage is a pleasure, in season, with great trails easily accessible from downtown. And the weather is not as severe as you think! 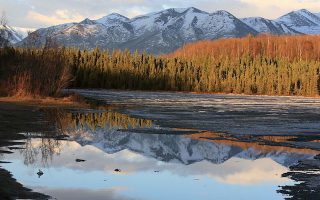 The natural beauty of the surrounding area is only one reason runners love Anchorage. Due to the extensive urban trail and bike path network, and the numerous cross country paths of Chugach State Forest, a devoted base of local athletes swear Anchorage is one of the best cities for running in the country. The downtown area has plenty of wide, inviting sidewalks, but unless you want to stop at a crosswalk each block, stick to the multitude of car-free cross-city trails. These include the Coastal Trail, Chester Creek Trail, Campbell Creek Trail, and Ship Creek Trail. One wild run near downtown is the Lake Hood paths around the massive seaplane base. Or, you can retreat to the forests on the Powerline Pass, Turnagain Arm Trail, or Far North Bicentennial Park. Be cognizant of wildlife when running in Anchorage — bears, and even moose, can pose threats to runners, especially in spring and summer. For this reason, some runners like to tackle the non-urban routes during the winter months. You can find a guide to winter trail conditions here. Note: some trails/paths might be closed to running in winter due to X-C skiiing. You can use the Winter Guide to Trail Use to determine what is open. Most tourists fly into Anchorage and get around via car. Public transportation is limited to non-existent, so if you’re without your own set of wheels, you’ll need to rely on shuttle services, which are pretty limited. Our suggestion? Take a bike, or use your own to feet to explore around town on the urban trail network — it’s fast, easy, and free! Special thanks to Multisport Training of Alaska and The Anchorage Park Foundation for their help with this guide! Spanning 11 miles across the Anchorage coastline, the Tony Knowles Trail is a well loved paved path with great views. Best Sections include Earthquake Park and Kincaid Park. One of the easiest and most accessible runs in Anchorage is the flat, 4-mile Chester Creek Trail, a paved path from Westchester Lagoon to Goose Lake. Protected greenbelt, through some residential neighborhoods, surrounded by forests and public parks. 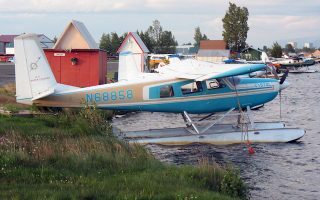 This relatively flat, roughly 4-mile loop utilizes the non-motorized trails around the Lake Hood seaplane base, just outside of the Anchorage airport. A unique run with seaplanes taking off and landing while doing a scenic route. 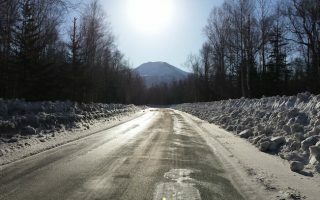 The Powerline Pass (in case you had any illusions) is a 14-mile beat-up dirt service road where wires stretch over the Chugach Mountains to Anchorage. A wide, well-maintained track for a cross-country outing. 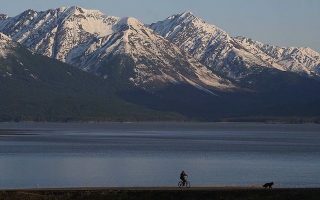 Another popular route in Chugach State Park is the Turnagain Arm Trail, which curls along the waterfront of the Turnagain Arm for 9.5 miles. Hilly. Great views, and one of the first trails to melt come spring. Easily accessible from midtown Anchorage, Far North Bicentennial Park is a great choice for a simplified trail run close to town. The go-to trails for runners are the Hillside Cross Country Trails. 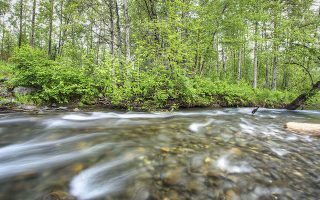 With Campbell Creek Park as its center piece, the 7.5 mile Campbell Creek Trail follows its namesake waterway from the University of Alaska Anchorage campus southwest towards Campbell Lake. 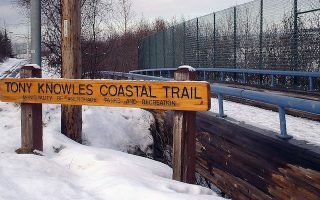 This 2.8 mile paved path is another crucial element to Anchorage’s urban trail system. 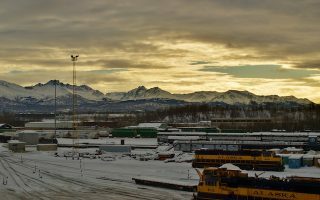 It stretches from the Mountain View Neighborhood in the east all the way to Alaska Railroad Depot. The weather in Anchorage is more moderate than you would think, owing to the maritime influence. Winters have short days due to the city’s latitude, often overcast, with average high temperatures in the 20s (-5C), and lows in the teens. About 75 inches of snow fall annually — not out of whack with some U.S. cities. Summers are mild but not warm, with average July high temperatures in the high 60s (19C). Enjoy those long summer days where the sun barely sets! Skinny Raven Sports is the go-to local running store. Great folks. Locations downtown and in Dimond. Group Runs: Pub run Tuesdays 6pm from downtown store. They also have a run club. Visit the AK Runners site for info on upcoming events. Also, the Skinny Raven running store sponsors several events throughout the year and has a good website for all Anchorage running events.